(MoneyWatch) The last jobs report of the year confirmed a 2-year trend of good but not great progress. In December, 155,000 jobs were created and the unemployment rate matched November's revised 7.8 percent. For all of 2012, the economy added an average of 153,000 per month for a total of about 1.8 million jobs, almost exactly the number created in 2011. The reason that we have not seen more robust job creation is due to sub-par economic growth, which has been hovering at around 2 percent for two years. The economy needs to grow by closer to 3 percent to create the hundreds of thousands of jobs per month required to dramatically lower unemployment and get more of those 12 million unemployed back on their feet. The December jobs report marked the 5th anniversary of the beginning of the "Great Recession", which makes now a good time to provide a snapshot of labor market progress. Beginning in December 2007 through December 2012, the U.S. economy shed a total of approximately 3.9 million jobs, of which the government accounted for a quarter and the private sector three-quarters. A devastating 8 million jobs were lost in 2008 and 2009, before the recovery created 4.7 million over the last three years. In other words, the job market has come a long way from the dark days of the Great Recession, but has a lot more ground to cover. 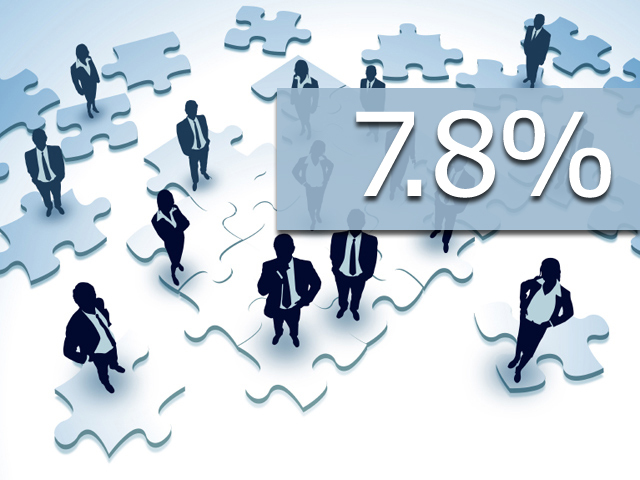 For 2013, economists predict that average monthly job growth should increase only slightly to 165,000 and the annual average unemployment rate will be 7.7 percent. Expectations are muted due to the second phase of the so-called "fiscal cliff" negotiations, which will focus on focus on a reduction in government spending in order to address the nation's mushrooming $16 trillion debt burden. It's important to underscore that when the government spends fewer dollars, it creates a negative impact on economic growth. J.P. Morgan chief U.S. economist Michael Feroli expects that fiscal cliff issues "will probably hold things back awhile." The extent of the damage depends entirely on the amount of reduction and the pace at which it will occur. Throughout the fiscal cliff debate, critics of tax increases and spending cuts worried that the dual effect would throw the country into another recession. Bill Black, associate professor of economics and law at the University of Missouri-Kansas City recently noted in a Naked Capitalism post that a dramatic reduction in government spending could inflict "austerity at a time when it is likely to throw the nation into a gratuitous recession...We have all seen austerity force the Eurozone into a gratuitous recession in which Italy, Spain, and Greece have Great Depression levels of unemployment...austerity is a policy that is the self-destructive economic analogy to the medical insanity of bleeding patients." Now that the patient (the U.S. economy) has survived trauma (the financial crisis) and intensive care (the Great Recession), it would be a shame to derail the recovery progress.